Mick Antoniw, Assembly Member for Pontypridd has congratulated Y Pant school in Pontyclun on being one of the first schools in Wales to be chosen to participate in the Massachusetts Institute of Technology’s world-renowned ‘Global Teaching Labs’ program. The MIT program is run annually and allows undergraduates to spend time in schools all over the world. For the first time, the Welsh Government has established a partnership with MIT and Y Pant was selected as the base location for Ciera Gordon, one of 3 MIT students who are based in secondary schools in Wales. “It’s been really wonderful to get to visit Wales and work with the students and teachers here. 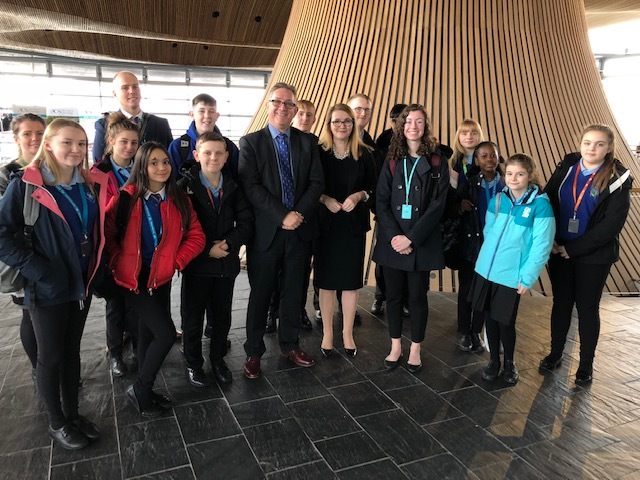 I had the opportunity to join the school parliament from Y Pant School on their trip to the Senedd in Cardiff, and it was really great to get to meet Mick Antoniw and see the Welsh Assembly during their Plenary meeting. I’m really excited to be a part of this pilot program between the Massachusetts Institute of Technology and the Welsh government, and I’ve enjoyed the opportunity to get to know Wales and develop my teaching skills here.